And the idea of Buenos Aires as the ‘Paris of the South’ long formed part of this, with its subtext that ‘of course, this means that it’s far grander and more sophisticated than any of those other, ordinary, scrubby little Latin American capitals’. But it’s still strange to see how much Argentinians still hold on, as an old habit, to Paris as their touchstone of urban refinement. For a giant mega-city in one of the rising economies of the Americas still to compare itself to an arch-historic capital of the old world suggests less a bragging confidence than a severe case of cultural cringe. And, after all, the image of Paris as the great model of urban refinement was itself at its peak at least a century ago, just before World War I. Surely, any rising city today would want to measure itself against Shanghai, Singapore, Dubai….? The ‘Paris of the South’ or ‘Paris of South America’ labels were coined during Argentina’s golden age, from about 1880 to the Great Depression of the 1930s. Exports of beef and grain brought money flooding in, followed by millions of immigrants, from Italy, Spain, Eastern Europe, Britain… Argentina’s millionaires – of many nationalities – drew admiring stares in European resorts and built lavishly at home, and the tango swept the globe. Around 1910, Argentina had one of the highest per-capita standards of living in the world, rivalling the USA and Australia and far ahead of most countries in Europe. And then things changed. The memory of this golden era has lingered ever since in Buenos Aires, reflected in the dull light of every subsequent disappointment, political crisis or economic collapse. Nostalgia for it can be felt in the city’s countless fascinating antiques and vintage clothes shops, or the preservation of the elaborate fileteado style of sign-painting, a mix of Neapolitan and Victorian British ornateness. Tango was already drenched in romantic yearning by itself, but with time has been further overlaid with an extra layer of nostalgic dreaming. 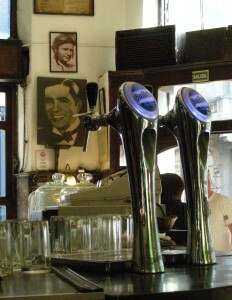 Carlos Gardel died in an air crash in 1935, but remains the King of Tango, never replaced, and his liquid baritone and irresistibly over-the-top cocky emotionalism still sound out across Buenos Aires, given a new lease of life since digital remastering removed the fried-egg noise from his 1930s recordings. The ‘Paris of the South’ is one more of these ghosts. For the golden age still dominates the physical landscape of central Buenos Aires, perpetuated in stone amid the huge, sprawling, traffic-snarled modern city. Paris’ status as the international benchmark of urban sophistication, elegance and progressive development was at its height in the 1880s, and it was then that Torcuato de Alvear, Buenos Aires’ first modern mayor, set out quite decidedly to make it the ‘Paris of the South’ by ordering the centre relaid with broad boulevards, modelled on those opened up in Paris 20 years earlier by Baron Haussmann for Napoleon III. French architecture too provided the most beloved models for both official and private builders, especially Loire-Valley French Renaissance and the sensuously ornate Beaux Arts style of the 1860s. It needs to be said, though, that Buenos Aires’ celebrated ‘Parisian’ buildings rarely look really like their French models. They nearly always have more mass, taller Mansard roofs, more Loire-châteaux pinnacle towers and more Beaux-Arts curves, more plain size, than Parisian patrons would generally have considered fitting. 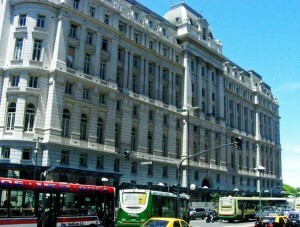 A prime example is the immense Correo Central or Secretaría de Comunicaciones that dominates the riverfront from Avenida Corrientes, the central post office, built by a genuine French architect, Norbert Maillart, between 1909 and 1928. This is surely one of the largest edifices ever created just to administer the mail, like a Second Empire city hall given a sudden boost in height by an earthquake. It’s French classic architecture pumped up on a high-protein, all-meat diet. The ‘Paris of the South’ is actually far more original and intriguing than any plain emulation of a European model, far more than Argentinians with their Parisian-grandeur fixation give it credit for. Golden-age Buenos Aires was not built in line with state directives or precise notions of urban design, but by Europeans who’d crossed an ocean to reinvent themselves and wanted to show they’d arrived, however many old-world ideas of how to put on a show they still had rolling round their heads. Parisian styles may have inspired the greatest devotion, but local patrons were also often wildly eclectic in their tastes, and their commissioning of foreign architects. Their projects did not conform to strict French rules of good taste, but stirred in extra touches of extravagance and exhibitionist fantasy. The real Paris is renowned for its sense of symmetry, proportion, visual order. Buenos Aires is instead ideal for connoisseurs of architectural surprises and the bizarre. 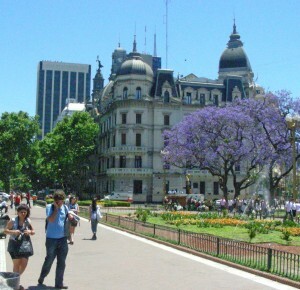 The Plaza de Mayo, the city’s historic hub, is itself a prime display of Buenos Aires’ grandiose eclecticism, hosting a real architectural menagerie around its central garden, now semi-permanently staked out by the protest camps of various human rights groups and Malvinas/Falklands war veterans. 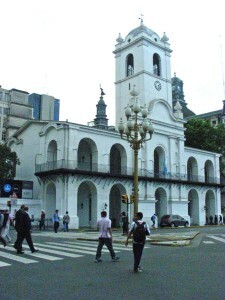 On the western, landward side is the 1720s original Cabildo or town hall – one of very few colonial buildings in the city – a simple building of two whitewashed storeys and a tower. It was once more spacious, before six of its original eleven arches were removed in 1889 and 1931 to make way for the new broad avenues into the square, but even so it was still modest in scale, a feature that together with its lack of any ornateness reflects the fact that Buenos Aires was one of the less prestigious centres of the Spanish empire. 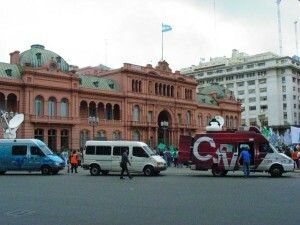 Facing it across the garden is the Casa Rosada or Pink House, the Presidential Palace, built in several stages but given its current form in the 1890s, and looking like a strange pink Italian-Renaissance train station, with what seems to be an unnecessary number of entrances. 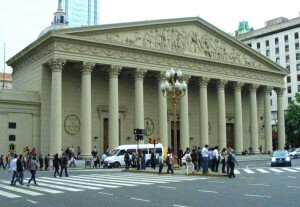 On the north side are the nondescript Cathedral, begun as Spanish baroque but given a rigorously Neoclassical façade by independent Argentina in the 1820s, and, dwarfing it, the National Bank, also Neoclassical but immense, and dating only from the 1940s. On the south side, monolithic functionalist blocks house more banks and government offices. And back on the west side soars up the also-immense ‘new’ city hall built in the 1890s after the Cabildo across the street had become inadequate, another definitive piece of ‘Parisian’ Buenos Aires, a giant combination of multi-storey townhouse and Loire château, topped by a jumble of domes, pinnacles, towers and ornate windows. Heading out of the plaza between the two city halls and stretching westwards for ten blocks to the National Congress is the Avenida de Mayo, foremost of Buenos Aires’ ‘Parisian’ boulevards, a classically French-inspired exercise in urban perspective, with the Presidential and Congress buildings supposedly viewing each other from either end. It was also the city’s foremost showcase of circa-1900 architectural grandeur. As you walk along it you find all sorts of fascinating creations and plain oddities among its soaring façades. A short way along on the north side is the Edificio La Prensa, a truly vast Beaux-Arts-style block built in 1898 as the offices of the newspaper of the same name. Its owner, José C. Paz, had a love for the architectures of la Belle France that clearly went even further than the norm, for as his own home he also had built a little to the north in Plaza San Martín a Loire Valley château in townhouse form, the Palacio Paz. The largest private residence in the city, it was still unfinished when he died in 1912, and since the 1930s has been a military officers’ club. One feature of the Porteño veneration for grand French styles is that it often became completely detached from their currency at home, as in the Palacio Urquiza Anchorena at Avenida de Mayo 747, a fine imitation of a Parisian apartment block of the 1870s, but built in 1921. And even here the city remained thoroughly eclectic. Right alongside the Urquiza are the elegantly clean lines of the Palacio Vera, Buenos Aires’ finest example of Viennese art nouveau or Jugendstil, the product of a 1910 collaboration between the Austrian architect Oscar Ranzenhofer and the Uruguayan Arturo Prins. Avenida de Mayo continues west of the 20-lane Avenida 9 de Julio – another classic of Buenos Aires giantism – with more idiosyncratic sights: striking art deco in the former Crítica newspaper building at no. 1333, built by the Hungarian Kalnay brothers in 1926 and now housing police offices, Gothic twirls elsewhere. One of the oddest grabs the eye right across from the pompous 1890s Congress building, a weirdly-shaped tower atop a curving multi-storey façade, like a Brothers-Grimm townhouse redesigned for a Disney cartoon. This is (or was) the Confitería del Molino, a bizarrely grand café built in 1917, the lights of which once shone out through stained glass across the square and presumably left the Congress in the shade. 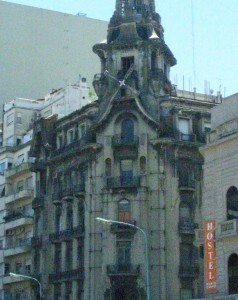 Sadly, like many of Buenos Aires’ less appreciated but most individual buildings the Confitería has been so neglected since the café closed in 1997 that it’s now in such a bad state – despite being officially a national monument – that it could easily fall down completely. 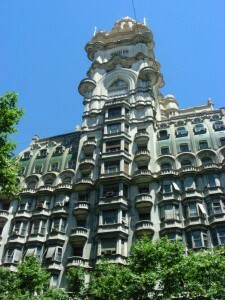 But, the most fabulously bizarre structure of all on Avenida de Mayo is two blocks back on the south side near the corner with Calle San José, the astonishing Palacio Barolo, one of the world’s strangest early skyscrapers, its facade appearing from street level like an immense cascade of seashell-shaped balconies. This was the tallest building in Latin America when it was completed in 1923 by Italian architect Mario Palanti for Luigi Barolo, also Italian, and who had made his fortune in Argentina manufacturing textiles. Both architect and patron were great lovers of Dante, and the Palacio is a web of intricate numerological references to the Divine Comedy, in the numbers of floors, windows or stairs, or an atrium-like stairwell that evokes the three circles of Paradise, Purgatory and Hell. The massive tower at the top contains a private lighthouse, and Palanti also built a very similar tower in Montevideo, the Palacio Salvo, with the idea that the two light beams would meet across the River Plate; however, they had miscalculated the distances, and this never worked. In style the Barolo is utterly eclectic, so much so that it’s been described as just ‘romantic’: parts of it have hints of art nouveau or art deco, but it also incorporated influences from Islamic art and Indian temples – especially in the curves of the great tower, supposedly intended to link Tantric love and Dante’s passion for Beatrice – and features that are completely original. (Guided tours are available, www.palaciobarolotours.com.ar). They’d probably never have let them get away with it back in Italy. Or Paris. If it’s so like Paris, why do the hot neighbourhoods go by names like Palermo Soho, Palermo Hollywood, Palermo Queens, Palermo Brooklyn, etc? The dynamism of Buenos Aires is that it’s a New World immigrant city, with communities from nearby countries (Bolivia, Peru, Paraguay) but also from more distant lands (China, Korea). A collection of mansards does not a Paris make – Buenos Aires is far more interesting than that. sorry! I meant “real estate”! That was, in effect, my point – or rather that even when ‘the Paris of Latin America’ was being created around a century ago it was already something far more inventive, crazy and off the wall than that old tag suggests. It’s just that Argentinians themselves still hold onto it, in a weird way, so you still hear it all the time. And as far as most people are concerned, the migrant communities you mentioned are seen as recent arrivals – the ‘core’ of Argentina’s population is more European than just about any other in the Americas, including the USA and Canada. I was looking for some papers on”progressive nostalgia” in Argentina and Google took me here. 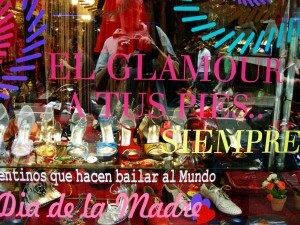 I have to say that this is the best description I’ve ever read about Buenos Aires. I think you have made a very interesting point about the city (which, perhaps, can help me with my paper as well), but also it says a lot about Argentinians (or should I say Porteños? ): this emphasis on “exhibition”, to the point that perhaps we should talk about an “exhibitionistic arquitecture” or even more, an “exhibitionistic style” in arquitecture (among other things). This could explain a lot about the way Argentinians (or at least a part of them) think and behave even today. I could see a fledgling research paper here! You should expand this blog entry into one! However, something you should correct: the “original” colonial Cabildo is not as “original” as you suggest. In fact, it was drastically modified between 1889-1931, when the three northernmost arches and the three southernmost arcs of the original eleven were removed to create room for Avenida de Mayo and Diagonal Sur. What you see nowadays is the remnant of a much larger building, that suffered several changes since 1764. A very interesting book that can help you to understand a little more about all of this is Gorelik, Adrián. Miradas sobre Buenos Aires. Historia cultural y crítica urbana. Buenos Aires, Siglo Veintiuno, 2004. Good luck with your paper. I promise to be your first reader!